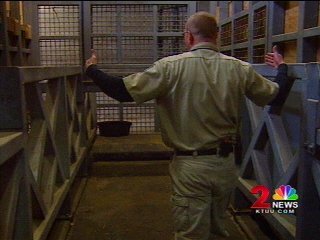 ANCHORAGE, Alaska -- Trainers at the Alaska Zoo have been quietly preparing Maggie, the state's lone African elephant, for the trip to her new home in California for some time now. They've been coaching her on air travel for several hours a day, since shipping an 8,000-pound pachyderm isn't a simple task. The Alaska Zoo said thanks to hard work, Maggie is slowly getting an idea of what to expect from her southern migration. 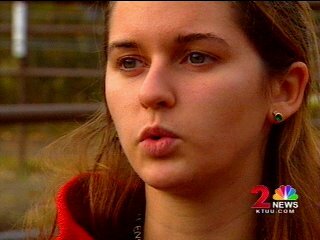 "We've been training for several weeks now," said Tessa Cara. "It's just a day-to-day process." Cara, one of two trainers working with Maggie to understand some new commands, said training depends entirely on the elephant's mood. "If she's really willing to participate we go for the high goals," Cara says. "If she's kind of feeling cranky, perhaps, then we take those down a little bit but we still work with her." The trainers must get Maggie inside an elephant-sized shipping crate to transport her to California. Before that happens, though, she must get acquainted with some new sensations like having all four of her feet chained. "We're just desensitizing her to having chains on because during the transportation she'll have to be chained," Cara said. The trainers put a hose around the chain to cushion it against Maggie's skin. She doesn't seem to mind the restraints as long as she has plenty of treats. The trainers reward Maggie with apples, peanuts and carrots for her good behavior. "If we really want to jackpot her, we give her a Jolly Rancher or something sweet because they love sweets," Cara said. To simulate the confines of the crate, trainers are putting Maggie's treadmill to use and have lined it with sheets of plywood. The trainers said the tighter quarters don't seem to bother Maggie, yet. Cara and other trainers play the sounds of a hydraulic loader and jet engines over the speakers in Maggie's pen. They want her as physically comfortable as possible before her big trip. Trainers will determine when Maggie is ready to leave for California sometime within the next few weeks. The crate Maggie will be shipped in should arrive at the zoo sometime tomorrow. 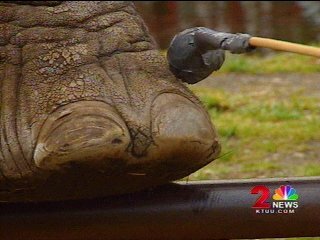 Zoo officials have not yet determined which air carrier will transport the elephant, although they have spoken with Alaska military officials, who have expressed some interest in the project.